Happy new year everybody! With the new year, millions of people around the world will be creating new year’s resolutions which, to be honest, most people will forget they even created by the end of January. This does not mean you should not make one for your PPC campaign though! It’s a great idea to create a few aims for your campaign to you achieve at the start of 2013. In doing so, you can address any problems you may have and look to improve your campaign to make it that bit more successful. When creating a new year’s resolution for your campaign, you need to think about what element of your campaign you want to create an aim for. If you want to create an aim for your landing page, the ultimately objective will to always improve your conversion rate. The landing page is the ‘last domino’ which, if ‘it falls’ (sorry for the bad metaphors! ), you will gain that conversion. As well as a conversion aim, you can look to create an aim that looks to increase, for example, the social media aspect to your campaign. I think it is a great idea to introduce social media buttons to a landing page. As well as gaining PPC traffic now, you have given your landing page the potential to gain traffic from social media sites such as Twitter and Facebook. The most important thing you need to remember is to make your aim should be centred around your campaign and, inparticularly, it’s most weak areas. If you are looking for a new year’s resolution to improve your click through rate, you need to develop your campaign in order to achieve this. 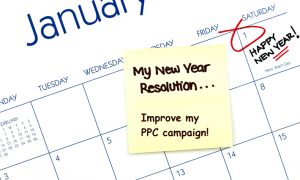 What can help a PPC campaign increase it’s click through rate? The advert itself. Are you using an image advert? Image adverts are given more freedom to advertise than text adverts. Your text advert. Are you using power words such as ‘free, money, save etc.’ to entice the web user into a click? Your campaign’s keywords. Are your keywords actually related to what your campaign is about? Or have you only picked them because you know the CPC for your chosen keywords are less. Already, I have picked out three areas you can look to improve a campaign’s CTR. I hope this makes clear how easy it is to improve the CTR in PPC. Another key statistical data from PPC is the cost per click. The problem with the cost per click is that some advertisers want the CPC to be high whereas some want it to be low. A high CPC suggests the traffic is of high quality. Therefore, there is a greater chance in a successful conversion. Whereas, a lower CPC can mean the exact opposite. However, some advertisers are more interested in the actual traffic produced from PPC than the quality of the traffic. It’s the old saying quantity vs quality. Make sure you know which one your campaign wants and set it as an aim to maintain throughout the year ahead.